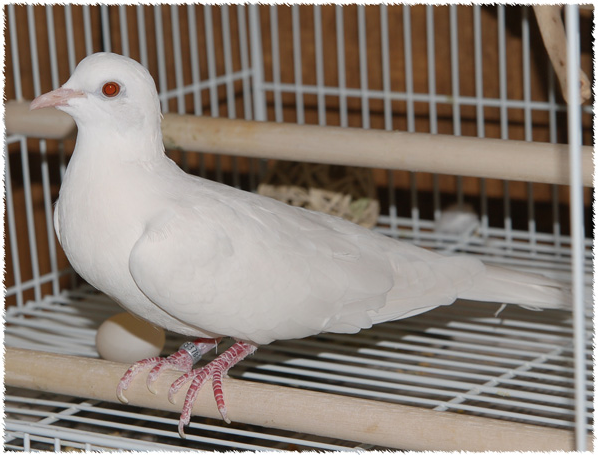 We recently lost something very precious to us, a curious and cuddly little, albino dove purchased 12 years ago named Rainbow. We are very grateful to God for the gift of our time with her, and the amazing ways He has displayed things about Himself through her. Doves are spoken of throughout Scripture, with perhaps most notable mention as Jesus comes out of the water following His baptism and the Holy Spirit descends on Him “like a dove.” (Matthew 3:16, Mark 1:10, Luke 3:22, John 1:32) There was no getting away from the remarkable visual symbolism this small creature gave. When we brought Rainbow home, she was an untamed and frightened baby bird. She lived at my husband's house when we were still dating, and when visiting I would get her out and just hold her, gently but firmly, knowing full well if I let go she would fly off. One day I had been holding her on my stomach for a while when something changed. This is difficult to describe well, but I felt her tension suddenly leave. She relaxed entirely. I slowly lifted my hands away and she didn’t move. She finally trusted me. We had bonded. This event constantly reminds me of the moment (actually, moments) when a person stops fighting, struggling and running, and finally trusts God. This has happened in my own life, when I finally believed in Jesus as Savior, and times since when I’ve had to really trust Him in my own circumstances that seem so unsettling. He shows me the One who is holding me really has my best interest at heart and wants me to know Him. I can relax because He is Good no matter how things feel. I do hope God will use these stories of our dove to also show you something about Himself perhaps you never saw before, or to remind you of truths you’ve heard. I pray He draws you close to Himself in whatever you’re going through, happy or sad, that He shows you the way out of struggling against Him so you find rest with Him, asking His forgiveness, accepting His help and believing in Jesus, the Resurrected One who is making all things new. Bottom line? Here's the most important thing that ever happened to me.